The DCCC's announcement specifically placed Obermueller's campaign against Kline on its "Red to Blue 2012" campaign for targeted races. 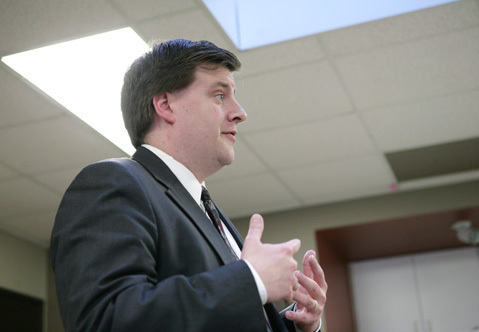 Former state Rep. Mike Obermueller announced Thursday that his newly DFL-endorsed campaign will have the backing of the national Democratic Congressional Campaign Committee as he looks to unseat U.S. Rep. John Kline in a newly redrawn 2nd Congressional District. There are 67 total races on the Red to Blue program now. Minnesota’s 8th Congressional District is also part of the program under targeted districts, although more specific backing is waiting for an endorsed candidate to emerge. The backing comes with no up-front financial commitment from Washington Democrats, but will allow the Obermueller camp to tap communications, messaging, strategy and technical support. On a conference call with reporters announcing the DCCC’s backing, Obermueller and campaign officials made clear they will look to paint Kline as a ultra-conservative Republican out of touch with a district that is thought to have grown more moderate in this year’s redistricting. The officials cited Kline’s votes to “end Medicare” and the recent spat over keeping student loan interest rates at reduced levels as evidence Kline has “an extreme Tea Party record [and] more in common with Michele Bachmann” than moderate voters in the 2nd Congressional District. Kline has held his seat since 2002, and has been re-elected relatively easily since. His district is thought to have picked up more Democratic territory this year, though, but many see the Democrats’ campaign against him as still an uphill climb.